The ecommerce industry is constantly evolving. Though trends continue to evolve from season to season, there are certain things that continue to be constant – especially when it comes to clothing photography. This article will reveal 7 costly mistakes made by product photographers and we’ll discuss what to do to avoid such mistakes and create magnificent image that can convert to sales. The desire of every retailer is to have products that look good enough to draw the attention of customers. However, as you’re well aware, certain factors can make your clothes wrinkled and creased; even transportation and storage can wear out clothing. Clothing samples are sometimes received in less than favorable condition. Making sure your garment looks nice and sharp before photographing them is a very crucial step in preparing to photograph, yet lots of apparel photographers don’t even bothe, as they’ll rather resort to Photoshop to fix the stains, wrinkles and other issues caused by storage or transportation. The truth is that, Photoshop is not magic; you need to devote a lot of time to perfect all the cutting-edge editing techniques, and every edit you do has a “destructive” effect on the ‘reality’ of the image, often reducing its quality. This is why you should only use Photoshop for your image’s colour correction, background removal or for final touches, and do all you can to get a perfect image of the garment on camera. Make sure the product looks as perfect as possible before you photograph it! It is essential for you to examine your product thoroughly. Get rid of stickers, tags or any other identifying material that ought not to be there. If you notice any crease on the product as a result of storage, then steam or iron it. Note that, tapes and lint rollers are perfect for getting rid of strings and dust from fabrics. There are certain situations where the wrong samples are sent because of some last minute mix up (e.g. colours, patterns, fit, etc.). Make sure you have a good grasp of the design changes for every garment to help you edit the sample appropriately during Photoshop or you can decide to wait for the actual sample to arrive. A lot of clothing photographers underestimate the importance of shape and fit in clothing images, so they don’t see the need to photograph the garments on live models or mannequins. Instead they prefer to hang the clothes on hangers or worst lay it flat. This is a terrible mistake! The best way to display the shape of the clothing and entice customers is by photographing it on a live model or mannequin. This way, the customers can easily visualize themselves wearing those clothes. With a little bit of styling, mannequins will bring out the best in your products! Models breathe life into clothes, but if for any reason whatsoever, a model cannot be used, then a mannequin can be a very good substitute and it is perfect if you’re on a low budget. 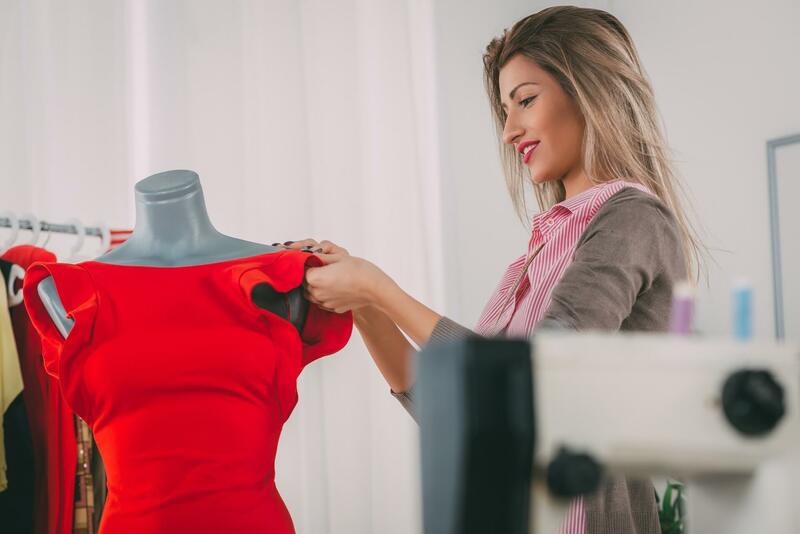 Seeing the natural drape and shape of the clothes, gives customers a realistic idea of what to expect and how the clothing will fit them – including enhanced shopping experience. If the garments are bigger than the mannequin, you can style it by pinning and tucking it so that it fits properly. Also, by using mannequins to photograph your products, you can easily create an professional post production technique known as the “ghost mannequin” effect. There’s a common assumption amongst clothing photographers that providing an image or two of every product is all it takes to give your customers an exact feel of the quality and feel of your products. This is a big mistake, It is essential to make sure your potential customers have adequate information about each product by uploading not less than 3 images for each product – preferably between 5 to 10 if possible. Websites such as Ebay or Amazon give room for users to upload between 9-12 images for each of their products; unfortunately lots of retailers don’t bother to take advantage of this opportunity to endorse their products. If you have the opportunity, you should photograph as many angles and views of your products as you can. At least take pictures of the traditional front, back and side view of every product, then supplement them with details of essential product embellishments like zippers, buttons or embroidery. By uploading different images of your products, you make it easier for customers to understand the product better. This will also offer them a unique shopping experience, demonstrate your product’s quality and guarantee customer satisfaction when the product eventually arrives. You can check out our blog for more detailed guides on how to maximize your Footwear, Accessories and general clothing. Try not to become one of those ecommerce retailers with product images that look underexposed and dingy. As an online clothing retailer, bright lighting is one of your biggest tools. Exposing your images perfectly will help you showcase the colours and details of your products accurately and also give your inventory a clean and professional look. Do not compromise on bright lighting. Every piece of clothing is unique and using the right lighting can give your potential customers a better appreciation of the uniqueness of the product. With adequate lighting, your camera can produce outstanding quality images, without much “grain” or “noise” and more sharpness. Dark lighting will produce poor image quality which can detract from the quality of your products. The best way to guarantee sufficient lighting is by renting artificial light equipment, but if you cannot afford that on your budget, you can try utilizing natural light by taking the photograph near a large window and using a reflector panel made with foam board. Check out our blog for more articles on lighting products for photography. If you don’t have the right camera settings, your images will never look professional even if you have all the photoshopping experience in the world. You can produce good quality photographs with DSLR cameras, but the wrong setting can have an adverse effect on the quality. Before you start photographing your products, make sure you have adequate understanding of the concept of aperture, ISO and white balance. Ensure that the ISO you’re using is not higher than 600-640. Using higher ISOs can lead to distracting “noise” or it can produce “grain” (coloured or grayish speckles) that make your photograph appear more grainy. When the camera is at a higher ISO, there’s only so much sharpness it can capture, which can result in certain details looking soft. By using a tripod, you can maintain your ISO at 200 or 100 for optimal sharpness and clarity. Aperture – represented by your camera’s setting number (e.g. f/14, f/2.6) is responsible for controlling focus. A larger aperture number can focus on more aspects of the image. From our clients experience, using f/22 gives us a sharper garment than f/3.5. This is why you should make sure your aperture is higher than f/11; as this will make it possible for you to focus on every aspect of your product. White balance is the colour base of an image. Generally, orange and red hues are considered “warm” while purple and blue hues are referred to as “cool”. An image’s balance is largely reliant on the source of light used as well as the white balance setting of the camera, which controls the camera’s interpretation of the colours recorded by it. There are different types of light sources, but fluorescent, tungsten, natural and LED are the most common. Your white balance can be set according to the light source you decide to use or you can set it at AUTO and leave the choice to the camera. Whatever you decide, make sure you have white balance or you might end up in Photoshop trying to recreate the right colours. You can take a look at our articles on general manual camera settings and ISO if you need additional help setting up your camera. Lots of product photographers are ignorant of the essential step that involves the conversion of edited photos to internet ready colour space profile. Colour space involves a specific range of colours which can be represented in a particular image. CMYK, Adobe RGB and SRGB are colour space options. If you fail to use the right colour space, the colour of the product will be inconsistent when viewed through different web browsers, computer screens, or even websites. The perfect colour space profile for consistent image and vibrancy between the different browsers, screen and site, is SRGB. If you decide to set your camera to reflect SRGB, there’ll be no need to stress yourself trying to convert the file to SRGB after editing it. However, SRGB’s colour range is narrower than the default RGB of your camera, which is why a lot of professionals would rather convert after the perfection of their images so as not to limit their editing ability. Lots of ecommerce retailers don’t bother to edit their product images well, particularly the cropping, colour, background and alignment. The best thing is to keep every alignment, background and crop identical for all the images on your site. If you want to keep your images consistent and reduce the time spent during image editing, develop standard specs for both editing and photographing. Ensure that all your items are the same size and centered within the image, so that all the corners, edges, angles will align together. Having well aligned images will boost your website’s brand appeal as well as that of your products. The best way to get the perfect alignment is by creating a set guideline for your Photoshop template. The different colours that can be used as a background for your products is endless. At first glance it might not appear very impressive, but making sure your product images are consistent with one another can improve your website’s professionalism drastically and enhance its appea. Picking one style for your background and sticking with it can also reduce your image editing time. It is considered widely that light grey and white backgrounds are the most attractive for product backgrounds. Giving an inaccurate representation of the colours of your garment is another common mistake made in clothing photography. Although you can get an accurate colour with your camera if it is allowed to choose through AUTO mode, certain colours, like reds are not easily photographed on camera and more often than not require editing with Photo editing software. Cropping and alignment are similar. It is essential to crop your product images identical to one another to give your customers a consistent experience when on your site. If you make use of guidelines for your alignment, then constantly cropping and sizing your images according to the image specifications of your website shouldn’t be a problem. It is easy for potential customers to become frustrated when colours are poorly represented, so it is advisable to take our time to make sure your products have the right colours before uploading them. The aim is for your potential customers to have a good idea of what they’ll be getting if they eventually decide to buy. There are different ways to alter colours, so go through your photo editing softwares offerings and pick the option that suits you best. After correcting the colours, don’t forget to convert the images to SRGB format to ensure that the web browsers, websites and users screen won’t alter the colours you labored to produce for your potential customers. We hope these seven bad habits can be eradicated from your approach to photographing products. We promise that getting rid of these practices will enhance the brand value of your website and greatly improve customer satisfaction.